Monica DiNatale’s 365 Guide New York City offers Restaurant Deals & Bar Specials that are getting everyone’s attention. toughest critics have to say! Monica DiNatale does an incredible job of providing a comprehensive list of restaurants, deals, and reviews for New York City. Each restaurant or bar is listed with the address (including neighborhood and public transportation info), hours, contact info, a well-written and personal review, drink or food specials, and any extra insider information. Whether you’re a resident or just visiting for a weekend, don’t leave home without this guide that will have you enjoying and imbibing without hurting your wallet. This book (365 Guide New York City) will make life for first-time NYC travelers a heck lot easier. Swishing through the pages, you’ll find the name of the bar/restaurant, its location, opening hours, contact details as well as why it has been a selected feature. All in all DiNatale does know how to have fun, and her picks are truly perfect for a complete NYC night-out. Listen to Monica DiNatale on http://wgso.com/?powerpress_embed=52648-podcast&powerpress_player=mediaelement-audio” target=”_blank”> WGSO 990 radio in New Orleans with Tim McNally. His show Dine, Wine and Spirits highlights the best in dining across the country. New York City is one of the most expensive vacation states in the United States. Often, visitors complain about the amount of money they spent on food and beverages. Sometimes, food cost come out of funds designated for shopping and site seeing. Fear not, someone has developed a fool proof way to enjoy New York City year round. Monica DiNatale, author of 365 Guide New York City, understands how expensive night life can be. In addition, she understands that the city has many cost friendly places that are hard to find. To save you time and frustration, DiNatale has written a detailed guide to help you navigate the city. 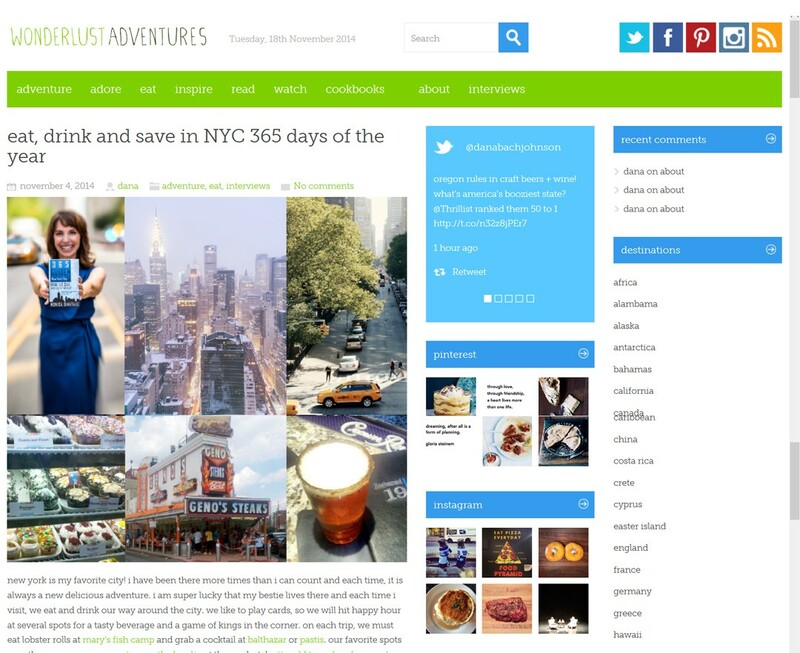 365 Guide NYC received an awesome review from Wonderlust Adventures. 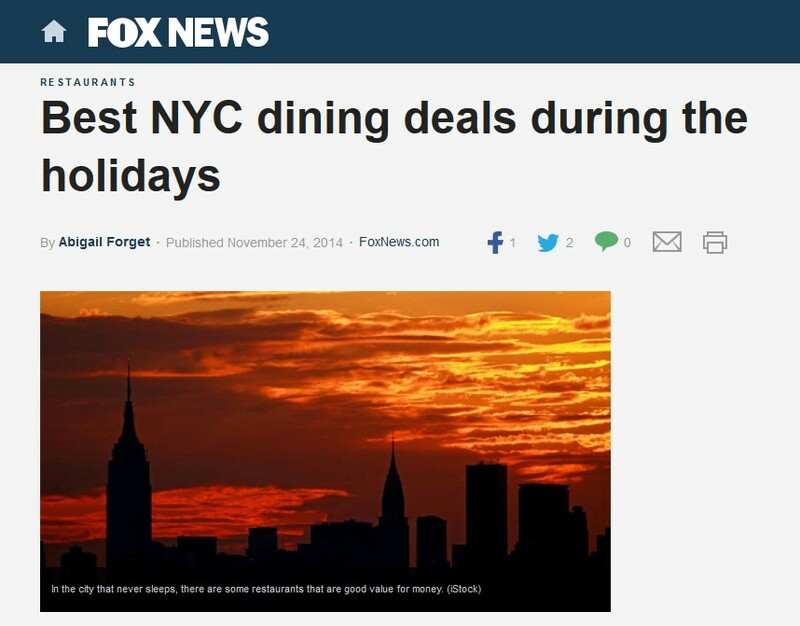 Fox News interviewed Monica DiNatale about the best restaurants in NYC for the Holidays. 365 Guide New York City is available on Amazon in paperback and ebook and full of restaurant deals and bar specials in NYC. A perfect gift for anyone that lives or travels to New York City.